The Australian Rollers have fallen in their final game of the 2018 IWBF World Championships group stage, losing to the Netherlands 53-58 ahead of the crossover game tomorrow night. 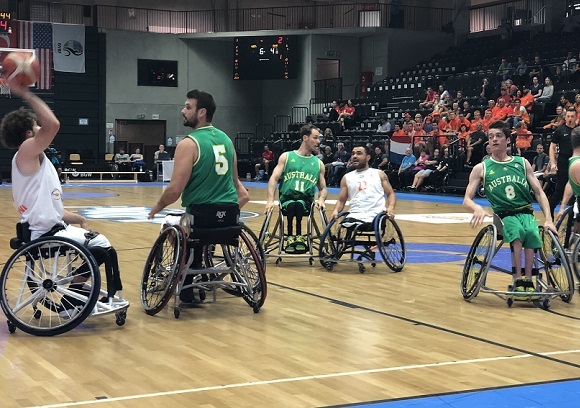 Unable to buy a basket in the first two quarters, the Rollers responded with an impressive second half but exerted too much energy in their comeback to be able to hold off the Netherlands. The loss draws the Rollers level with Argentina and the Netherlands on 2-1 records in Group D and they now await news on their opponent in the crossover game tomorrow night with every contest from now on an elimination game. From the opening tip, Australia struggled to find the bottom of the basket and the Netherlands jumped out to a 10-4 lead while hitting five of their first eight shots. Tom O'Neill-Thorne (16 points, six rebounds, four assists) sparked the Rollers by scoring their first six points and a big line-up change from coach Craig Friday helped reel in the deficit as Michael Auprince (four points, two assists) nailed two quick shots to keep the margin at six at quarter-time. However, the Rollers were held scoreless for five minutes into the second period and while both teams were putting up attempts late into the shot clock, the Netherlands were able to execute better and push out to a double-digit lead. Bill Latham finally broke the drought from the free-throw line and that got the Rollers into a little bit of rhythm while O'Neill-Thorne's activity helped them finish the half on a 6-0 run as Latham (12 points, seven rebounds, five assists) and Luke Pople (four points) saw some shots fall. Executing coach Friday's play perfectly out of the main break, Latham gave the Aussies a great start with a mid-range field goal and at the other end, the Netherlands started to miss a couple of shots to match Australia's woes from the first half. Latham then connected with a pin-point pass to Jannik Blair (three points, one assist, one steal) who was streaming down the court for a fast-break lay-up and while Shaun Norris (five points, nine boards, four assists) struggled all night, quick makes from himself and Tristan Knowles all of a sudden gave the Rollers their first lead of the game heading into three-quarter time. After shooting 25% as a team in the first half, Australia knocked down 10-15 (67%) in the third quarter and everything seemed to be turning their way. The teams traded baskets in the final stanza for the first few minutes but a Norris turnover was followed by a Netherlands three-pointer, their only make from distance on the night, and that put them back in front. Knowles (four points, three rebounds, two assists) was able to add to his personal tally with a nice fake and drive but the Netherlands had re-found their stroke and they put together six points in less than a minute. Brett Stibners gave the Rollers a glimmer of hope in the dying stages with a three of his own but time was against them as Australia fell by five points. Find the box score here and watch the replay below. Stay tuned to Basketball Australia's social media channels for information on the Rollers' next opponent and game times.